Make any purchase between December 1, 2006 through January 15, 2007 and stand to win some exciting prizes - including a VIP card that qualifies you for 25% discounts on ALL PURCHASES throughout 2007! SONY Playstation 3 Console - 5 Winners! One of the most talked about item this holiday season, The Sony Playstation 3 is is unarguably the most sophisticated gaming platform in the world. Sporting super high definition graphics (supports 1024p resolution on the latest LCD TVs), this console's graphics looks so real that it pulls you into the virtual world for hair-raising action! In cooperation with our sister store, RENCHI.com, which has been good enough to get us the latest machines direct from Japan, we are offering to give away 5 consoles (60GB versions with WiFi capabiilty) to 5 lucky winners! Nintendo Wii Game Console - 5 Winners! In the other corner of the rink is the Nintendo Wii console. Choosing not to fight head-on with the SONY PS3 with super sophisticated graphics, the Wii focuses on it's innovative controller that is motion sensing to the point it can detect whether you are swinging it like a sword, tennis racket, golf club, or light saber. The result is games that allow you to control the virtual character in the same way that you would control yourself - grab the controller and make a serving motion to serve in Wii's virtual tennis, swing the controller like a sword to slay monsters in Legend of Zelda. Undoubtedly this controller can be used to make sophisticated 1st person shooting games to let you practice during the airsoft off-season! Again thanks to our sister store RENCHI.com who has secured 5 rare consoles for us (they are sold out world-wide), we are giving away to 5 lucky winners! We are giving away free VIP cards to 50 raffle winners! VIP cards will entitle winners to year round discounts on purchases at RENCHI.com throughout 2007! 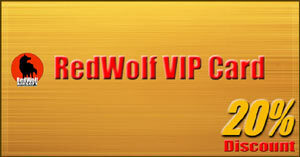 Raffle tickets are assigned electronically in RedWolf's system during successful checkout and delivery of your order. Raffle drawing will be conducted under observation by Arthur Lee Accounting Services Ltd to ensure fairness. Note that purchase values above do not include shipping costs. 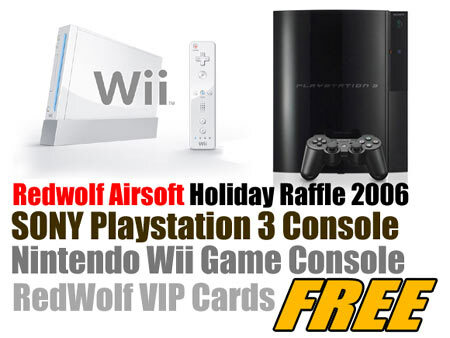 Winners of our raffle will be announced January 25th, 2007. Good luck!